Choice of Games has now opened registration for the first school year of villainy! Get educated in the ways of evil and start your career here! 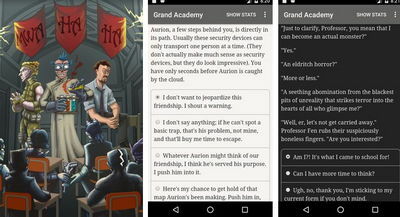 Play using this unlocked version for Grand Academy for Future Villains (full) and enjoy this incredible text-based adventure right on your Android phone or tablet. 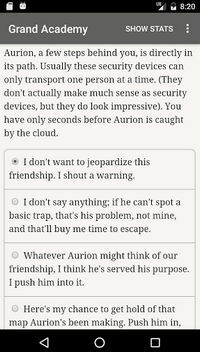 Enjoy this hilarious 200,000-word interactive novel and control the story as you wish. The storyline is powered by your choices so whatever the ending maybe, it's you who wrote it. Remember that the school for the wicked requires your full attention and dedication if you want to make it in the world! Looking for a career as an evil overlord? A mad scientist? A megavillain, a wicked witch... you need hard work, dedication, and thorough education... the Grand Academy for Future Villains (unlocked) trains the bad guys that every good story needs. There is much to do in the academy. You can seduce a hero to the dark side, become a monster in the lab, rival other students, find love, save your alma mater or betray it, and much more. Play now, find an internship, become a supervillain, conquer galaxies, break hearts, and have fun! This version unlocks IAP , enjoy!